The 10 Best Tattoo Parlors in Utah! Whether you’re looking for your tenth tattoo or your first, Utah’s welcoming and professional parlors are here to help you out. Guests can expect a clean, comfortable space at any of the state’s best shops. Along with that, you’ll find seasoned veterans of the tattoo game, boasting a masterful collection of work. Here are the 10 best tattoo parlors in the state. Formerly Cathedral Tattoo, Mercy Expert Tattooing is a hip tattoo parlor with young, up and coming tattoo artists. With an emphasis placed on traditional American tattoos, Mercy Expert Tattooing can nevertheless do pretty much whatever you ask. And the best part? The parlor allows for walk-ins every day of the week, so if one day you spontaneously decide you want a tattoo, this is the place to go. Yellow Rose Tattoo is known for its consistency, professionalism, and ambience. With fair prices and pristine working conditions, you know that at Yellow Rose, you’re getting exactly what you want. The parlor’s artists treat all of their customers—whether walk-ins or appointments—with the same patience and courtesy. At Anchor Ink, you can expect your tattoo procedure to be on time and for the procedure to be relatively quick. The parlor’s artists pride themselves on precision and achieving the exact look their clients envision, or maybe even something better than their clients envision. Tattoo addicts are extremely loyal to this shop—the cleanliness of the facilities, the friendly staff, and the attention to detail make this place a cut above the rest. 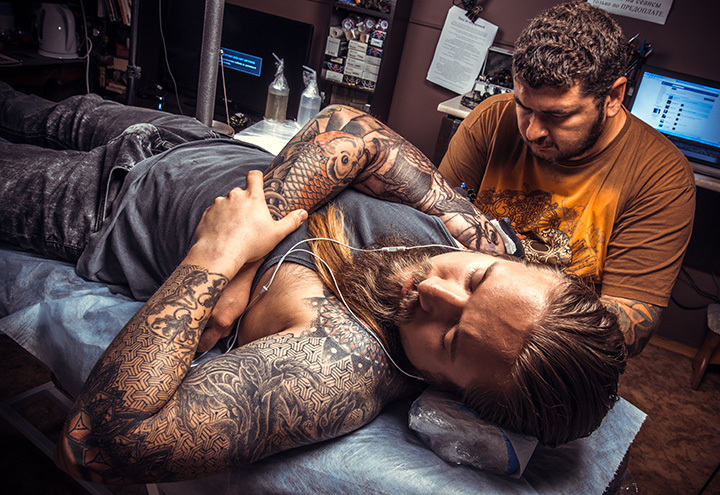 Arguably Utah Valley’s most popular tattoo parlor, Arcane Art Tattoo is a trusted establishment with incredible tattoo artists that help you to feel comfortable and at ease with your decision. The parlor is also known for its piercing services—some moms even insist on taking their daughters here to get their ears pierced because of its professional and friendly staff. Alpha & Omega in St. George is a wonderful, comfortable environment to get a tattoo. With excellent prices, a staff with years of experience and skill, this is the place to go. Located in Utah’s second largest city, Ogden, Savage Tattoo Shop has “25 years of combined experience” and touts a group of artists that are not only passionate about the art of tattooing, but about making your tattoo experience positive. The owner of My Pride Tattoo really believes you should be proud of your tattoos. He wants you to leave happy, relaxed, and overall, elated. My Pride Tattoo knows that in order to maintain a consistent customer base, it is important to offer the best possible service. At My Pride Tattoo, you’ll definitely feel taken care of. SLC Ink Tattoo has been around for a while and they recognize that if you’re considering a tattoo, you’re likely putting a lot of thought into the design and possibly have doubts about your decision. That’s why they recommend an individualized consultation so that you can have a conversation with your artist to talk about your expectations and concerns. Convicted Ink Tattoo and Laser Tattoo Removal wants potential clients to know that all of its tattoo artists are not former convicts. Nevertheless, its employees do know what it’s like to feel judged for something they’re passionate about. Convicted Ink Tattoo and Laser Tattoo Removal is a community of knowledgeable artists and regular clients. Lucky Bamboo Tattoo and Gallery is obsessed with tattooing as a unique and beautiful art form. The parlor has both regular artists and guest artists to diversify its offerings throughout the year, as well as periodic specials and discounts according to the season.